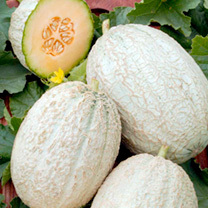 Smooth pale greenish-yellow fruits about 11.5cm (4½") in diameter, with firm, very sweet, salmon-pink flesh. More tolerant of low temperatues than most Cantaloupe varieties so will bear fruit even in cool summers. 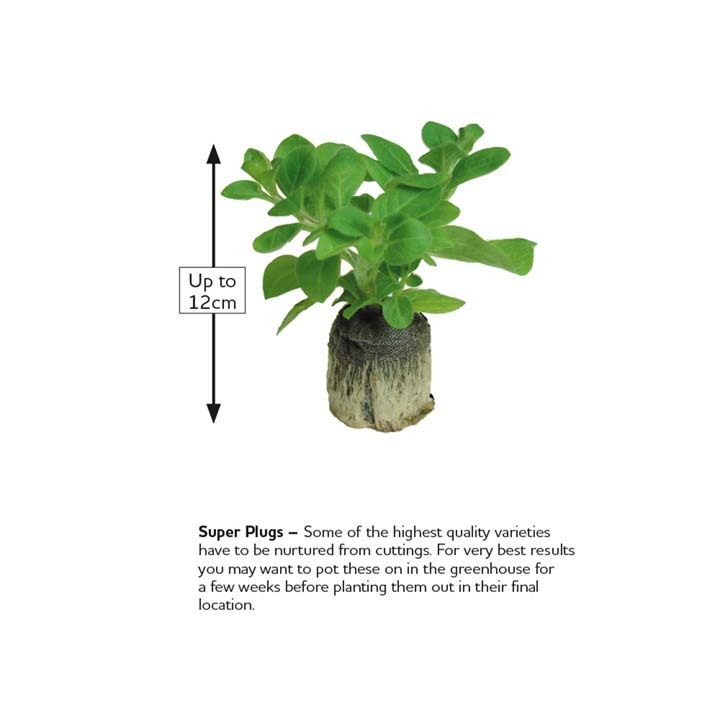 For growing in frames, under cloches or fleece in the garden and recommended for northern districts. RHS Award of Garden Merit winner. Please note: There is a possibility that your plant will include a grafting clip, if it does, this is an integral part of the grafting process and that it should be left in place. As the plant grows it will naturally shrug off the clip. On Receipt - Check the plants are moist and grow on in 10cm pots using a good quality potting compost maintaining a temperature of 16-18ºC (60-65ºF). providing a cane support. Once the roots fill the pots transfer into 30cm (12″) pots or plant in the greenhouse border 60cm (2') apart. The plants are not suitable for growing in grow bags due to the strong root system. Greenhouse Culture - Provide horizontal wire supports and pinch out the growing tip when the plants have reached a height of 180cm (6'). Pinch out the growing tip of the side shoots at the fifth leaf. The resulting shoots will produce the flowers. Male and female blooms should then develop on the new growths. Allow six fruits to mature on each plant. Artificial pollination may be necessary to aid the fruit setting, and this is carried out by pinching off male blooms, stripping the petals and pushing the exposed centre into the female flowers. Female blooms may be recognised by the swollen stalk, just below the flower. Carry out the pollination about midday, and if possible treat all flowers on one plant at the same time. The resulting fruitlets should be thinned out to six per plant when they have developed and are swelling. Pinch out the growing point of the shoot two leaves beyond the fruit. Once they have reached tennis ball size it will be necessary to provide a net support, many gardeners use a pair of ladies tights. For the best results maintain a temperature of 21-24°C (70-75°F) and on hot sunny days damp down the pathways to increase the humidity. Liquid feed with a tomato fertiliser, commencing when fruits are about the size of a golf ball at 7-10 day intervals until the fruit starts to ripen. Watering should be reduced as the fruit ripens and a little more ventilation given. Frame Culture - Plant out in late May. After hardening off the plant, transfer to the frame. Pinch out the growing point at the fifth leaf. Select the four strongest shoots and train towards the corners of the frame. Allow one fruit per shoot to develop and pinch out the shoot two leaves beyond the developing melons. Any other shoots and flowers should be removed. The compost should never be allowed to dry out. 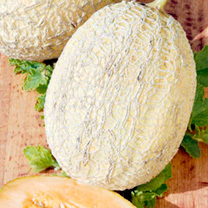 When growing in frames each fruit must be supported by a flat tile or piece of wood to prevent contact with the soil which would cause the melon to rot. Reduce watering once the fruit starts to ripen and stop feeding.